Singapore March 15th: Here at the ACi Maritime Communications Conference, the clouds of war are gathering. Inmarsats Distribution Partners (DPs) and customers are rising up in unprecedented fury in response to Inmarsats recently announced price hikes. Driven by an ill-advised telephone company-like strategy, the communications giant has instituted unexpected dramatic and crippling price increases to its Standard, low use plans. This has sliced the margins of their distributors and has incited customers to action. Time is almost upas discontent mounts into open revolt, Inmarsat terminals could soon be sinking into the sea. M2M is a growing segment for the satellite industry, although satellite still has only a small share of the machine-to-machine market which is largely dominated by cellular systems: around 2 percent in terms of volume and 6 percent of revenue in 2011, according to IDATEs findings. The annual Dubai CabSat show was another humdinger and bigger than eversome major players were in town to show their flags and make heavyweight statements that the Middle East/Africa markets are just as important to them as North America, Europe, or the Asian region. Indeed, while Arabsats giant booth dominated the satellite end of the hall (Sony and the likes of Panasonic were at the other end), it was SES which had a significant presence, both in terms of booth size and staffing, especially when you include the O3b booth and YahSat/YahLive contingent. It was also interesting to see SES Platform Services present and busy. The installed base of container tracking systems will reach one million by 2016. According to a new research report from the analyst firm Berg Insight, the number of active remote container tracking units deployed on intermodal shipping containers was 77,000 in Q4-2011. Insight: A Pervasive Global Force... Maritime SATCOM, By Jim Dodez, Vice President, Marketing and Strategic Planning, KVH Industries, Inc. The maritime market is a pervasive global force, consisting of six major segmentsshipping, offshore oil and gas, commercial fishing, passenger vessels, government and military vessels, and yachts. There are more than 250,000 vessels in the maritime market that are good future prospects for broadband communications and they are enjoying an increasing range of options (and prices) for bringing this critical benefit onboard. Satellite has played the key role over the past five years or so in bringing connectivity to users who are either in a remote location, or not so remote but too far from the cable infrastructure. Apart from access to the Internet, a satellite connection does, of course, enable the end user to receive broadcast media in just about any location. However, many providers of satellite broadcast content restrict their offerings by geographical regionwhat do viewers do if they want to watch a Scandinavian channel in Alexandria, Greece, or content broadcast from Australia for viewing in Hawaii? As one of the oldest forms of long-distance transportation, maritime vessels have been the backbone of commerce in nearly every region of the world for thousands of years. Approximately 90 percent of world trade is carried by the international shipping industry, nations defense and security efforts depend on navies and coast guards, millions of passengers every year go on cruise and ferry vessels, and there is a vast armada of service, supply and scientific vessels worldwide. Traditionally, cruising was all about getting away. Today, its still about getting away while staying connected. Does that sound paradoxical? Well, it is. And therein lies the challenge for communication companies serving cruise operators. The HX System from Hughes is designed and optimized for small to medium-size networks, and employs the key features needed for a wide range of applications, such as Internet access, IP trunking, cellular backhaul, Virtual Network Operator (VNO) hosting, and communications on-the-move (COTM). A key feature of the HX System is the ability to cost-effectively scale to large networks, providing operators with an effective platform on which to start small and grow as their business grows. 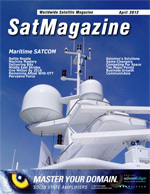 The Asia-Pacific region is earmarked for significant growth2012 will see many of the worlds largest satellite companies, including GlobeCast, Inmarsat Global, Intelsat, MEASAT Satellite Systems, Newtec and Thaicom amongst others, assembling at CommunicAsia and BroadcastAsia, Asias largest ICT and media communications event. As the Asian satellite market continues to grow, these industry players are using the event as a strategic platform to address the critical issues surrounding Asias marketplace, while accentuating their presence in the region. Case Work: Solomons Solutions, By Katia Gryadunova, Pactel International Pty Ltd. Founded in 2003, Pactel International provides enhanced satellite communications solutions for a variety of markets throughout the Asia-Pacific region. One of Pactels key advantages lies in its ability to leverage supplier relationships to create reliable, cost-efficient networks for remote sites and rural locations across Australia, Indonesia and Pacific Islands.